Jonathan Tavares is associate curator of arms and armor at the Art Institute of Chicago, and leader of the team behind the “Saints And Heroes” installation. If you are one of the many medieval enthusiasts who enjoy this show, and who studies (or perhaps even re-creates) famous battles, dueling, jousting, hunting, knighthood, and the ideals and literature of chivalry, then I’ll bet you have a “bucket list” of arms and armor exhibitions that you have visited, or want to visit in your lifetime – places like the Vienna Art Museum, the Royal Armouries in Leeds, the Tower of London, or the Army Museum in Paris. You don’t even have to leave the US to enjoy a world-class display of medieval armor: the armor galleries in the Metropolitan Museum of Art in New York, and the Higgins Armory Collection at the Worcester Art Museum in Massachusetts attract thousands of visitors each year, and are among the best in the world. But if you’re checking off the locales on your own “top ten armor galleries” list right now, there is a new name you may have to add: The Art Institute of Chicago, which (earlier this year) opened a completely purpose-designed space, the Deering Family Gallery and Exhibition, to house a permanent display of some 700 items of medieval and Renaissance arms and armor, along with various associated artworks in a collection called “Saints and Heroes” – most of the armor on display there has been off of public exhibition for more than a decade, and some items have never been publicly displayed before, ever. 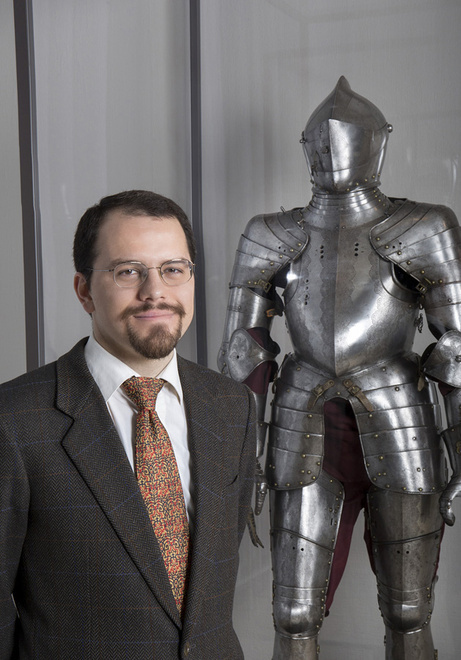 In 2013 Jonathan Tavares took on the post of associate curator for arms and armor and European decorative arts before 1600 at the AIC, and was instrumental in the planning and creation of the armor gallery. Jonathan has studied historical arms and armor at the Metropolitan Museum of Art, and has taught courses on fashion and armor at the Rhode Island School of Design and the Fashion Institute of Technology in NY City. He has lectured to academic groups including the American Society of Arms and Armor Collectors, and the Armor and Arms Club of Manhattan. 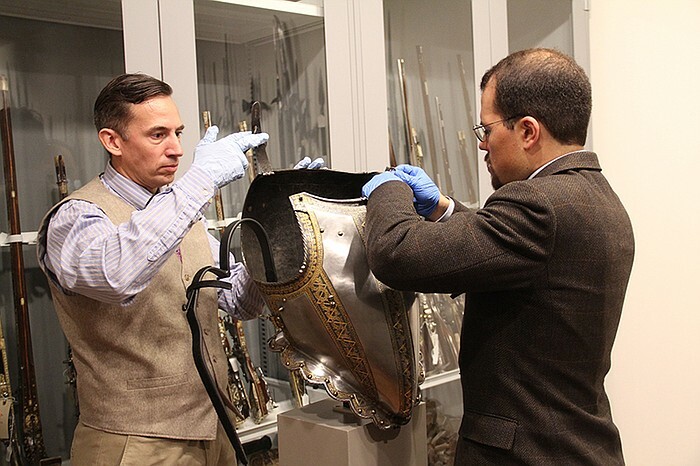 Jonathan Tavares assists armor maker Jeffrey Wasson (left, interviewed in episode 20 of the Chivalry Today podcast) in meticulously measuring the armor reproduced for the special Nova: Secrets of the Shining Knight. And – as if designing a world-class museum gallery didn’t keep him busy enough – Jonathan was also heavily involved in the recent episode of the PBS documentary series NOVA, called “Secrets of the Shining Knight,” which chronicled the reproduction of an entire set of 16th century Tudor armor from iron ore to finished product, which he worked on as one of the primary historical advisors to the show. But apart from providing a new, publicly accessible home for this marvelous collection of armor, the Saints and Heroes gallery also invites visitors to contemplate these pieces of artwork within the context of the society and fashion of their times, giving us a glimpse into the quickly changing culture that was the real world of the Age of Chivalry – and was, in that respect, not so different from our own. Of course, most medieval knights were hardly “saints,” and few of them really even qualify as “heroes,” so just why do the armor, swords, guns, and other items of armament we associate with them create such a heroic image in the minds of the people who see them – both in the Middle Ages, and in today’s world? Does our modern fascination with the romance of chivalry create a rosy mythology around instruments of warfare and death? Or is there a lesson to be learned in these medieval artifacts about the importance of ideals of courtesy, nobility, and heroism in a distinctly non-honorable age that we can apply to our own world? Jonathan joins host Scott Farrell in this episode to talk about the newly opened gallery and what it has to teach us about knights of the middle ages and Renaissance, and the code of chivalry.